The connection between chronic pain and depression runs deep. There are many different ways that these two chronic illnesses overlap. Here are 26 things you need to know about chronic pain and depression. The simple fact that chronic pain and depression don’t have visible symptoms make these two conditions difficult to treat on their own, much less together. Chronic pain sufferers are much more likely to suffer from other mood disorders like anxiety than those who don’t suffer from chronic pain. Monitoring pain levels can help manage depression levels, too. Keeping track of food, sleep, and exercise with a pain diary app can help pain patient see how these things relate to the level of both chronic pain and any depression symptoms. Getting outside in nature is a great way to boost mood and keep the physical body healthy. 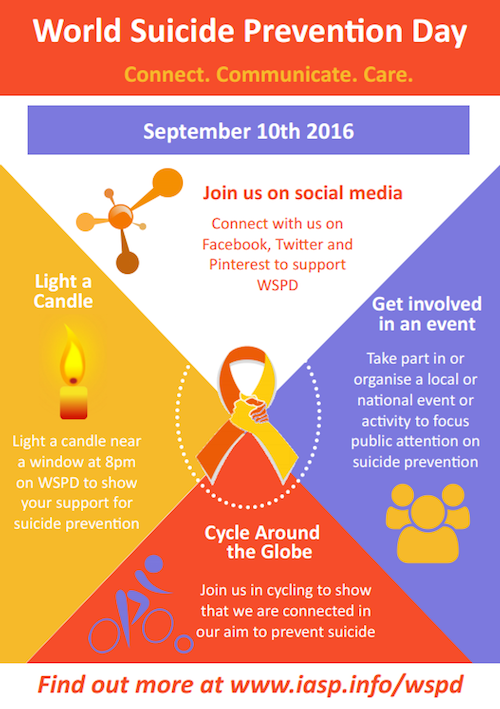 September 10th is World Suicide Prevention Day, a day to raise awareness and prevention strategies for suicide. Chronic pain patients are at much higher risk for suicide attempts and completion. It’s important to recognize the signs. It is unclear how they work, but anti-depressants are commonly used as a method to treat chronic pain. Many patients experience an improved mood and a decrease in pain after just a few weeks. Meditation is commonly suggested to reduce the perception of pain, but it can also be successful in treating depression. Barring a physical cause of chronic pain, much of chronic pain is due to patterns and grooves worn into the brain. This can also be the case for depression. The connection between chronic pain and depression is a two-way street. It used to be that researchers believed that chronic pain caused depression, but new science is showing that it can go either way. Achy body or sore joints? These may be symptoms of depression. Mindfulness meditation, exercise, changes in diet: all of these treatment recommendations are listed for both chronic pain and depression. Treating one also helps to treat the other. Chronic pain may ache in the body and depression may ache in the mind, but the effects of both are far-reaching. Relationships, work, and hopes for the future are all impacted by these two conditions. One of the most damaging side effects of chronic stress is the increased chance of developing serious health conditions including chronic pain and depression. A good night’s sleep can help improve mood and decrease the perception of pain. There are many different ways to improve sleep naturally to help with both chronic pain and the symptoms of depression. Because stress can intensify chronic pain and depression, managing it through diet is a great way to work through all three conditions. Many who suffer from chronic pain and depression may feel guilty for taking time out for massage, meditation, or a hot bath, but these things can be an essential part of treatment. Compassion fatigue occurs when caregivers of those with chronic illness reach the end of their rope. Caregivers face high levels of depression and illness as well, and prevention of compassion fatigue is important. When chronic fatigue and depression strike in a rural area, specialists and therapists may be hundreds of miles away. Telemedicine can help bring specialists to a patient online, resulting in high-quality care wherever patients may live. Research is now noting that minority populations are undertreated for chronic pain and mental illness, even though their need may be greater and more complex. Chronic pain and depression disproportionately affect women, but women are routinely left out of medical research including clinical trials. Our returning soldiers often struggle with the triple threat of addiction, chronic pain, and depression, with few resources tailored to their specific circumstances (and Veterans Administration hospitals closing all over the country). Talk therapy is one of the most crucial treatments for both chronic pain and the symptoms of depression. This can be with a traditional therapist or with new options, such as free (or more affordable) therapy online. Sometimes the difference between a successful treatment and one that does not work is a little extra support. Can saying “Thank you” actually decrease the amount of pain you feel? Probably not, but it can certainly put things in perspective. Remembering all of the things you are grateful for can serve as a reminder that there are actually good things happening in your life, which can help treat both chronic pain and depressive thoughts. It can truly be a struggle to stay positive when your body is wracked with pain and you are feeling depressed. If there is any way to find even one small ray of hope, your chances for pulling through your pain and depression increase exponentially. The connection between chronic pain and depression is powerful. Talk to your doctor today about addressing both conditions. Doctor of many years is no longer available for treatment. I’m so tired of the hunt!!! Hi Deb — We recommend reaching out to a doctor in your area: https://paindoctor.com/get-relief-now/ or using the tips here to find one near you: https://paindoctor.com/pain-management-doctors/.